Amboise lies on the eastern borders of the Touraine province which symbolises for many a “douceur de vivre” and the Garden of France. The vines are also part of the specific landscape of the region and they enjoy the unusual light known by many painters in the Loire Valley. From Amboise to Tours, the vineyards carry the evocative names of Vouvray and Montlouis. Here, food and wine are part of an “art de vivre” (an art of living) faithful to a long tradition, portrayed by poets, writers, novelists, painters and thinkers: Ronsart, Rabelais, Du Bellay, Balzac, … without forgetting the royalty of the Loire Valley – the former Kings and Queens of France –, and the famous Leonardo da Vinci, called by the French Léonard de Vinci. Amboise is a small town compared to neighbouring cities such as Tours, Blois and Orléans. With its 11,500 inhabitants, the town has quaint narrow streets with old half-timbered houses. Built on the left bank of the River Loire, this small old feudal little town is dominated by its impressive chateau. Amboise saw many kings of France who were born, lived and died there. Amboise’s fame peaked between the end of the 15th century and the beginning of the 16th. King Charles VIII spent his all childhood in the old castle and, once as the young king, thought about renovating and enlarging his residence into a more luxurious and comfortable place. But in 1496, everything changed: the King had been fighting in Italy and had discovered the Renaissance. He came back to Amboise with many ‘souvenirs’ such as furniture, pieces of art and Italian fabrics, together with craftsmen – architects, painters, sculptors and tailors. But the unfortunate King died in Amboise aged 27 in 1498, two and a half years after his retreat from Italy, from a head injury. He struck his head on the lintel of a door while playing Jeu de Paume (old-style tennis), fell into a coma and died. His successor, King Louis XII, resumed the works and added a second wing parallel to the one built by Charles VIII in the Renaissance style. At that King’s death in 1515, France’s first Renaissance monarch came onto the throne: Francis I (François 1er). During his reign, the Kingdom of France made significant cultural advances. However, even as the expansion works on Amboise’s chateau continued, the new king neglected Amboise for other residences such as Blois, Fontainebleau and Chambord. Nevertheless, Amboise became the last home for a famous Italian: Leonardo da Vinci; it was Francis I who invited the great painter to live in the Clos-Lucé manor in Amboise. The Amboise Conspiracy (1560) was a tragic event in the History of France, setting some protestant Huguenots against the powerful and catholic militant House of Guise. It all started when a group of provincial protestant aristocrats secretly gathered around Godefroi de Barry in Nantes, frustrated at not being able to practice their faith freely. Their initial plan was to kidnap the King, the young Francis II, removing him from the influence of the House of Guise, the supporters of militant Catholicism. This action however, was not encouraged by all Protestants at the time: certainly not by John Calvin, the Admiral Coligny and other nobility of protestant faith, who refused to agree to such an act of violence and condemned it. But the conspiracy became known by the Guise and the King, who left Blois for Amboise, reputed to be more easily defended. The repression was then terrible: as small groups of Huguenots totaling between 1,200 and 1,500 Huguenots reached Amboise, they were arrested and killed. Some were hanged on iron hooks on the chateau’s walls; others were thrown, inside bags, in the River Loire, decapitated or torn apart. The leader, Godefroi de Barry, was caught and his body “drawn and quartered” and then displayed at the gates of the town. This first war of religion settled down in 1563 when a peace treaty was signed in Amboise… which would only last 4 short years! This failed attempt by Huguenots to wrest power over France by abducting the young King Francis II set the tone for the coming Wars of Religion that would divide France from 1562 to 1598. So as you can see, Amboise was not such an idyllic place as it appears nowadays! The castle is it appears today may look impressive. In 1873, the castle and its gardens were given to the descendants of Louis-Philippe. Today,one of those descendants, the Count of Paris, has taken responsibility for its maintenance through the Fondation Saint-Louis.However, in the 16th century, it was even larger and more sumptuous. From the 17th to the 19th centuries, the chateau was partially dismantled. In the 19th century, King Louis-Philippe endeavoured to restore the castle, which was recognized by the French Ministry of Culture as a ‘monument historique’. Unfortunately, the King’s abdication in 1848 put a halt to the works. It was then confiscated by the government and served as a home of exile for Emir Abd Al-Qadir. In 1873, the castle and its gardens were given to the descendants of Louis-Philippe. Today,one of those descendants, the Count of Paris, has taken responsibility for its maintenance through the Fondation Saint-Louis. The chateau is located on a high rocky promontory which dominates the city and the River Loire. It is reached by a long pavement leading to a wide terrace. From there, the view over the city, its surroundings and the River Loire is fantastic. During the Renaissance, the terrace was a courtyard surrounded by many outbuildings of the chateau, which disappeared in the 19th century. One of the main attractions of the chateau is the isolated gothic chapel that rises high upon the fortifications. It is the only building of the former outbuildings along the walls that stands today. This chapel, dedicated to St Hubert, was erected in 1491. It contains the tomb of the supposed remains of Leonardo da Vinci. If you happen to visit Amboise during the summer, make sure you don’t miss the sound and light show, with 400 professional and volunteer actors using the chateau as the centrepiece. It recounts the story of the chateau, from its erection to the Renaissance era of King Francis I. The show is a popular event which lasts 90 minutes from June to August. Le Clos-Lucé is another major landmark of Amboise, located some 500 metres away from the royal chateau. This stunning manor was initially built under King Louis IX in the 13th century and was substantially renovated into the Renaissance style when acquired by King Charles VIII in 1490 for his wife, Anne de Bretagne. Le Clos-Lucé successively housed the young King Francis I, his sister Marguerite de Navarre, and his mother Louise de Savoie. But Le Clos Lucé became famous with the presence of Leonardo da Vinci who spent the very last years of his life there. In 1516, King Francis I invited the famous painter and inventor to stay in Le Clos Lucé, from where he organised the royal Court parties and worked on his own projects. Leonardo accepted the invitation and came to France with his most famous painting, the Mona Lisa, which is now displayed in the Louvre Museum in Paris. The King even commissioned an underground passageway to link Le Clos Lucé to the royal chateau of Amboise. Leonardo da Vinci died in the manor on the 2nd May 1519, aged 67. On your visit to Le Clos Lucé, you will discover that the manor has become a museum specialising in the multifaceted works of Leonardo da Vinci. Your visit will give you a good idea of how they have contributed to the enrichment of the Renaissance era throughout Europe. Inside the manor, the local history of Amboise’s region is displayed in various interesting rooms and cabinets. In the park, you will discover the brilliance of Leonardo da Vinci, with 15 models of giant machines designed by the inventor, and 32 translucent canvases showing some of his sketches and details of his paintings. On the road to Chenonceaux lies the Parc des Mini Chateaux. This is a park covering 5 hectares, which houses the 1/25 scale models of the 50 most famous chateaux of the Loire Valley. If you can’t see all of the authentic Loire chateaux at once, visiting this park will be the next best thing… One piece of advice: come at dusk when the illuminated show of the model chateaux brings a great fairytale atmosphere to the place for young and old alike! At the edge of the Amboise woods stands a curious monument: a 44 metre tall Chinese Pagoda which was erected in 1775 by the Duke of Choiseul as an imitation of the one in Versailles. The Duke used to be King Louis XV’s most powerful minister, before falling in disgrace in 1770. He retired to Amboise and built a castle which disappeared in the 19th century. The Pagoda is the only building left standing on the Duke’s estate, and also the largest “folie” inherited from the Ancien Régime. The Pagoda is open to the public and you can reach it by climbing an indoor staircase. From its top (149 steps), the beautiful view stretches above the forest to Amboise, the Loire Valley and as far as Tours. The chateau de Chenonceau is only 18 km away from Amboise. 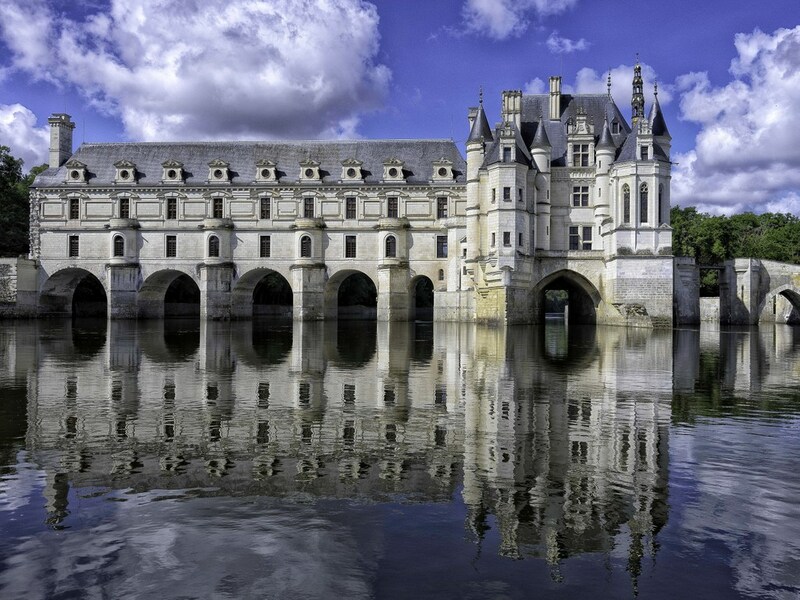 This chateau is arguably one of the Loire Valley’s most famous, with its arches spanning the River Cher. Chenonceau is one of the most popular chateaux in France… which becomes obvious as soon as you arrive, as there are so many visitors. Amboise is an easy 2 hours from Paris by motorway (A10). Amboise is located between Tours (27km) and Blois (36km). Orléans and Le Mans are not far either. By train, Tours is linked with Paris’ station Montparnasse, by the TGV Atlantique network (1h journey). Regional trains offer regular services from Tours to Amboise. If you are travelling from Australia or America, the best way to reach the Loire Valley is to take a flight to Paris Charles de Gaulle airport and rent a car from there, or take the TGV to Tours.